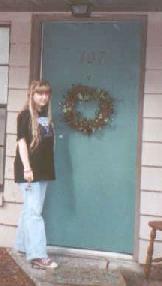 Here's my old apartment in the Woods, in Gainesville, Florida! 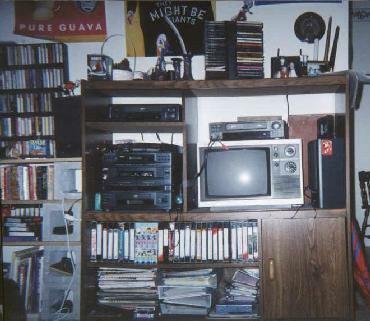 I lived here for six years, from 2000 to 2006. It was a rather small apartment, but I'm a rather small person, so it worked for me. 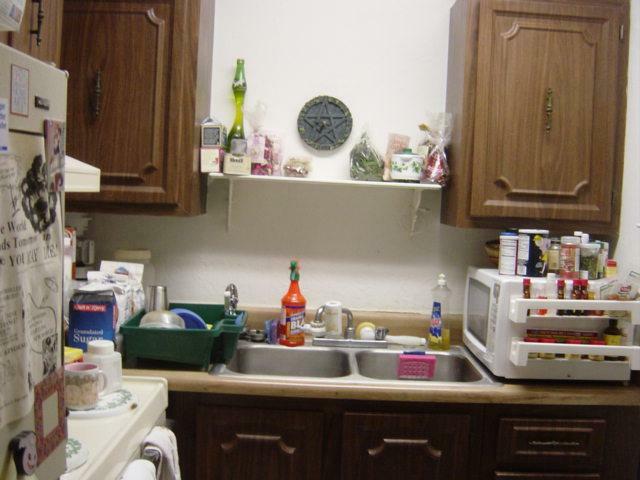 It had a kitchen with a small dining area, a rather large living room, a little bedroom with an adjoining bathroom, and a spacious closet. 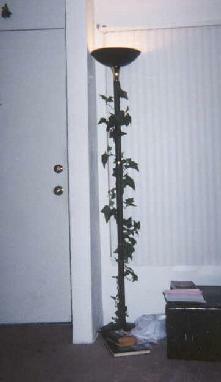 Most of my apartment was decorated with an ivy theme, which was especially evident in the kitchen. 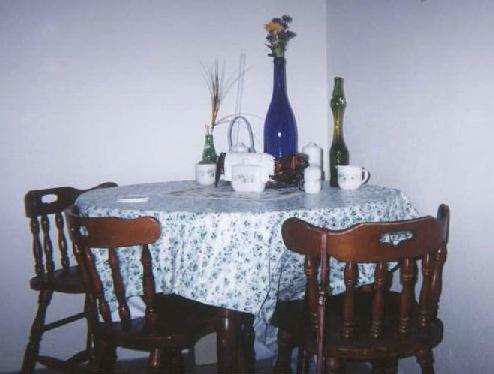 I had ivy borders there and a little kitchen table with ivy placemats and an ivy tablecloth, and a little cooking center. 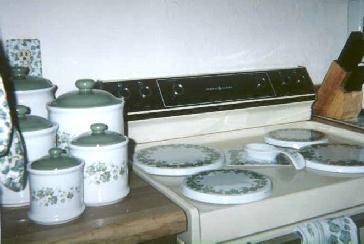 I also had a little ivy clock in there, and ivy dishtowels and stuff. My fridge opened the "wrong" way and was covered with alphabet magnets. The decorations on the kitchen table changed with the seasons. My living room contained a couple lamps (one of which had fake ivy winding around it). 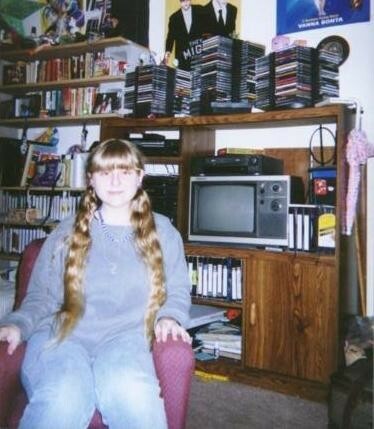 I had my computer desk in the living room, and a little loveseat-sized couch and an entertainment center, and bookshelves made from cinder blocks and wood (yeah, cheesy, I know). A few posters decorated the walls. My altar was in the corner next to a trunk where I kept all my arts and crafts supplies. There was a window covered by blinds, above which I wound a seasonal garland that changed eight times a year. 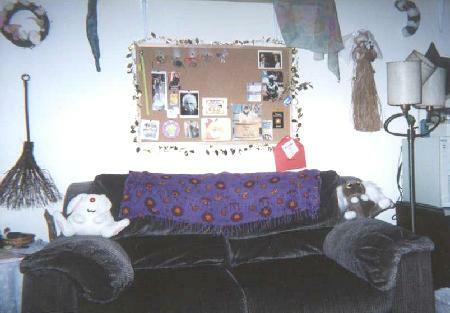 I also had a shadowbox and a bulletin board, and two shelves that held stuffed animals and toys. My bedroom was cozy and cute. 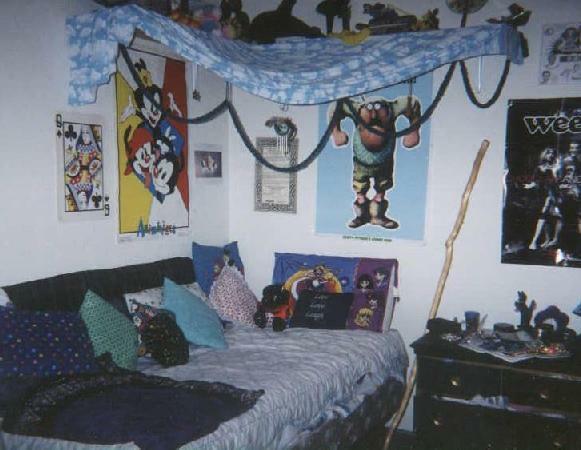 It had a bed (obviously) that was covered with pillows I made, and it had a cloud-printed canopy hanging over it from two shelves that displayed other odds and ends (mostly odds!). 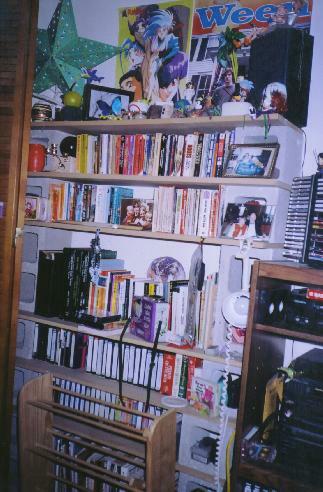 I had more bookshelves (three more sets), a nighttable, and a dresser in there, plus a tiny chair just my size. 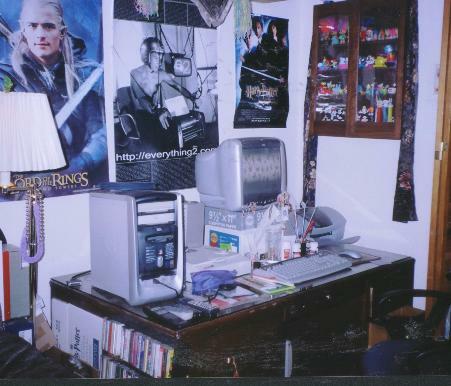 Posters adorned the walls there too, and a couple of calendars. 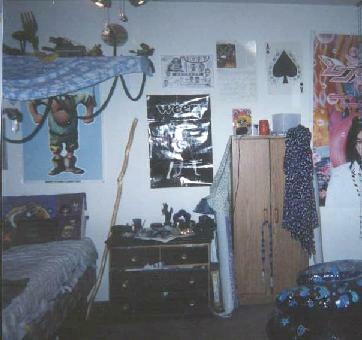 I had a star-shaped fuzzy clock, an inflatable baseball bat, and an inflatable tube of toothpaste. My closet had no door except for the plastic bead curtain I put there. 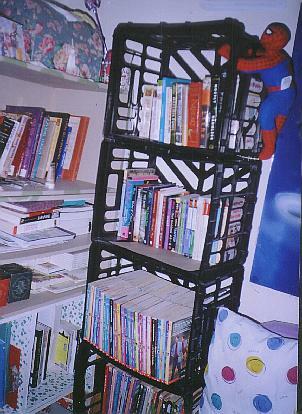 It was full of shelves, as you might expect, where I put all my clothes, seasonal supplies, and toys. 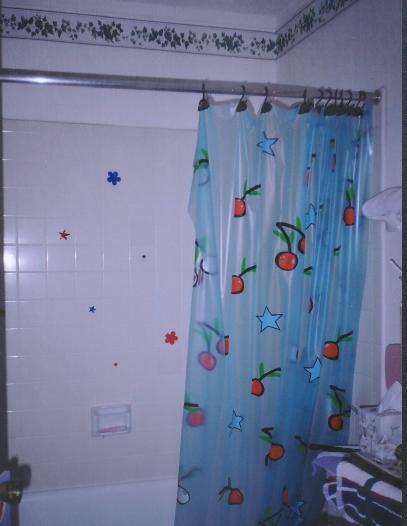 And the bathroom . . . decorated with lizards and eyeballs. Yes, lizards and eyeballs. The eyeballs were everywhere . 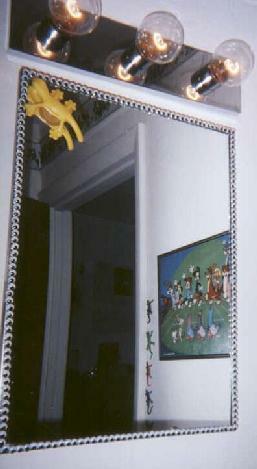 . . googly eyes bordered the mirrored cabinet and watched even from the toilet paper roll, and squishy fake eyeballs sat in candle holders on the back of the toilet. They would be watching you. You'd better flush, wash your hands, and put the seat down! 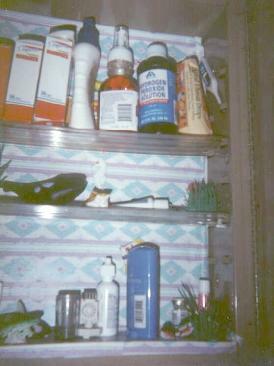 Inside my mirrored cabinet, I had decorated it like a little aquarium with plastic fish that swam among my health supplies. The carpet was tan, the walls were white, and a good luck broom hung by the front door. It felt like home.